Who is Grammy Mouse, Maine Folk Artist? Grammy Mouse is the pseudonym that I use for my folk art painting. I am sort of semi-retired from painting and don’t paint as often as I used to. There are health reasons that without going into a long detailed explanation involve my asthma, COPD, the medications for those conditions, and the odors/fumes from paint. So although I don’t produce as much work as I used to, I still enjoy creating my art when the days are right and I can paint. I’ve shared my folk art here on the blog. In the past, I have posted painting craft patterns that I produced for the craft industry when I designed for acrylic paint companies. Here are the links to those patterns just in case you have never seen them. I will be sharing more DIY painting projects in the future. Today I would like to share a few of my Americana folk art paintings that have a summer seasonal theme. 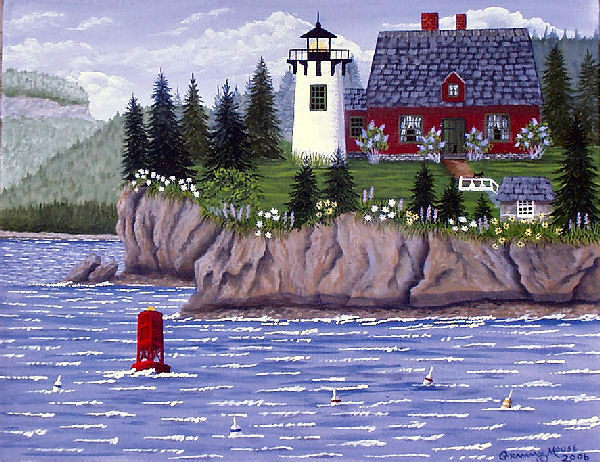 I live in the wonderful state of Maine famous for its lighthouses and I often use them in my paintings either as the main subject or in the background. 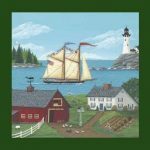 Below is a folk art painting that I did of Bear Island Light. The light keepers house is painted a different color today but research showed that it appeared to be red at the turn of the century. This lighthouse is located on Bear Island just off of Mount Desert Island and is visible only from the water. If you ever take a whale watch tour from Bar Harbor/ Mount Desert Island be sure to watch for it. 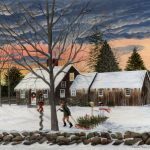 Quite a few of my paintings are licensed for the home décor industry, greeting cards, and published as art prints. This one of a Maine coast saltwater farm is one of my favorites. 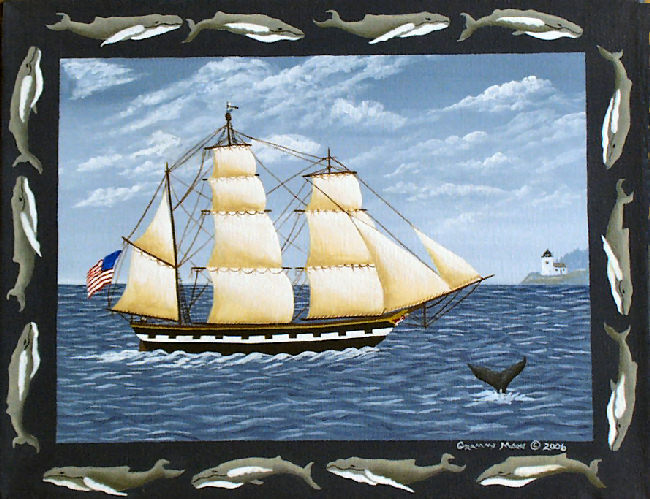 This painting is signed in a slightly different way – the signal flags on the windjammer spell out Grammy Mouse. Penny Lane Art Publishers published it under the title “New England Retreat”. There is definitely a coastal trend running here but I paint other themes too. 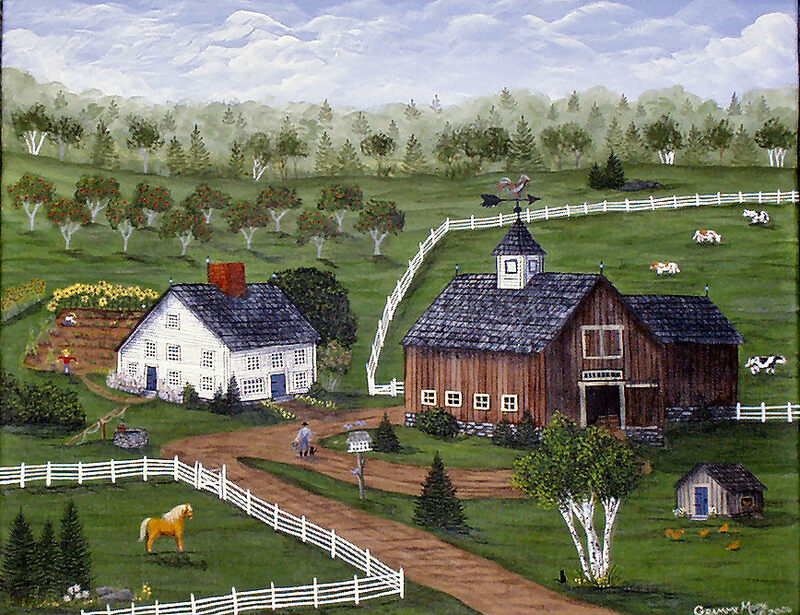 I love painting buildings – houses, barns, old farms, villages, and shops. 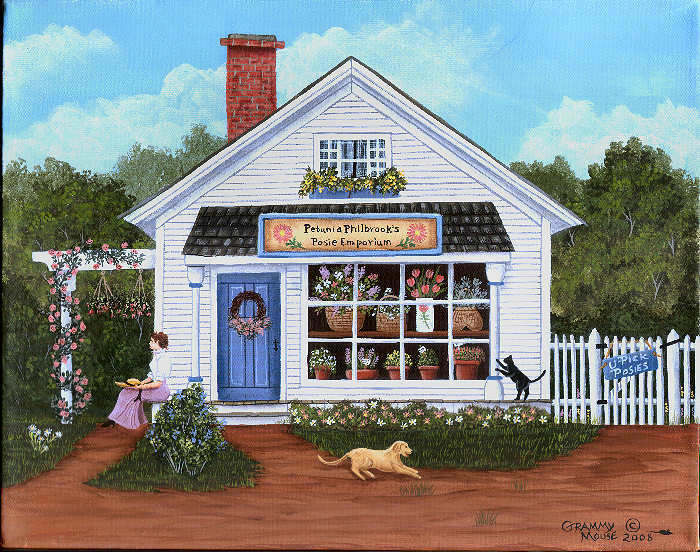 Below is “Petunia Philbrook’s Posie Emporium”, an imagined flower shop from yesteryear. Fantasizing in my paintings is one of my favorite pastimes when I make things the way I wished they were. It’s my little world and I can do whatever I want. hmmm.. didn’t Bob Ross say something like that! I love the shingled cottages of the New England coast. One of my dreams is to own one but until then I can create my own coastal hideaway in folk art. 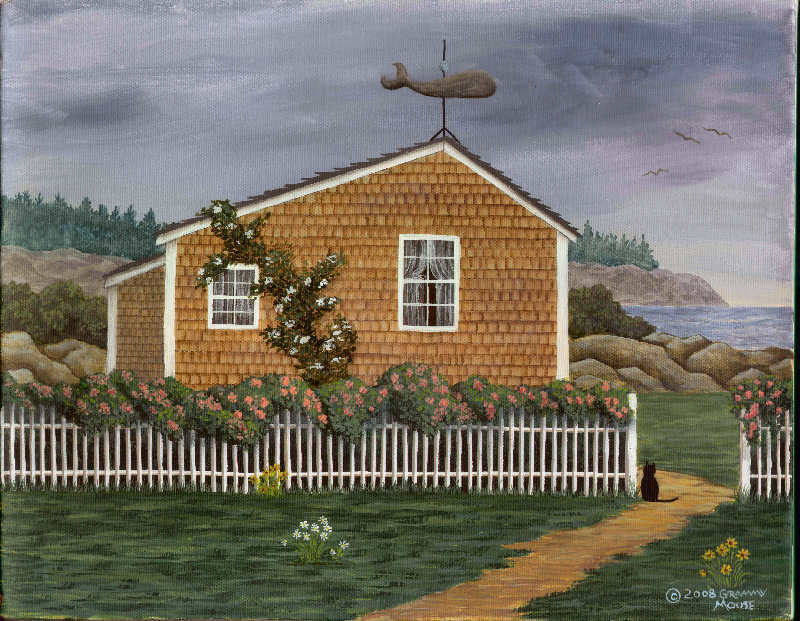 This painting is called Whale Point Cottage. If you haven’t noticed, you will find a black cat in most of my paintings. I have numerous black cats over the years. Right now, the resident black cats here at the Thompson house are Chuckles and CJ. Old farms are everywhere here in New England. I love painting them as I can add such fun details. Folk art paintings should tell a story. 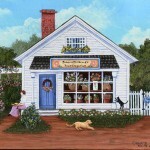 The work of Charles Wysocki is one f my favorites. It was always incredible the amount of detail he would put into a painting. You could spend hours studying one and still find something new. Haven’t thought about some of these paintings in a long time. Looking at them today makes me want to dust off the brushes and create some thing new. If you enjoyed this, sign up to be on my mailing list and I will let you know when I get so self indulgent as to visit more of my Americana folk art paintings. We have 3 more seasons to go!!!! You can purchase Grammy Mouse Signed Folk Art Prints by clicking here.